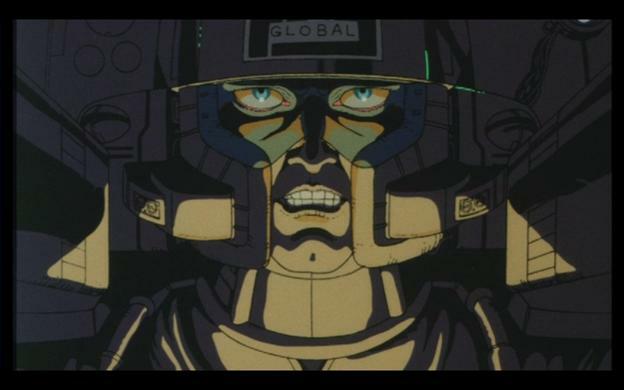 Released in September 25, 1987, Neo-Tokyo is an anthology of three short anime films made by three different Directors. It comes from Madhouse, the same studio who brought the West Trigun, Vampire Hunter D: Blood Lust, and Ninja Scroll to name a few. 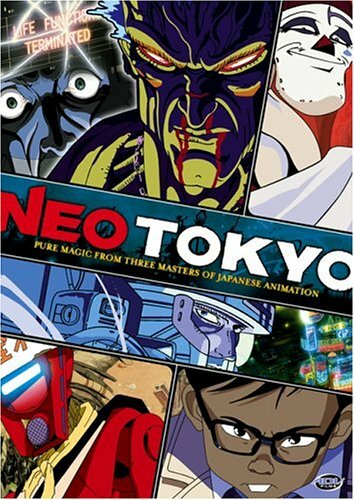 Neo-Tokyo was produced by Masao MARUYAMA (Tokyo Godfathers; Monster (Anime Adaptation); The Gokusen (Anime Adaptation) and Rintaro (The Phoenix: Chapter of Yamato (OAV) Reign: The Conqueror) who is also one of the three directors with a segment. The first segment is called Labyrinth which is directed by Rintaro (Galaxy Express 999; Metropolis). Out of all the segments in Neo-Tokyo this one will be the most confusing. It does not really follow a story but rather shows a little girl and her cat playing and exploring various settings. 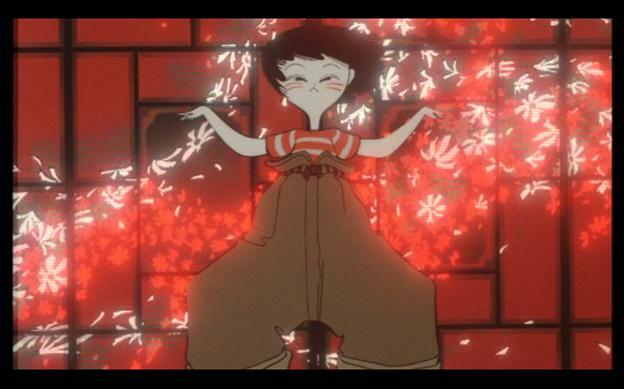 The characters are beautifully animated, flowing smoothly and fluidly while on screen. The art style for the main character resembles the Japan woodblock paintings of old. It is a good juxtaposition to the environment that seems to fit well with the characters running around in it. Most of the backgrounds look like they were made from dark pastels. One thing they do is light up certain objects or characters to put an emphasis on them. Red seems to be a reoccurring color that they use. An example of this would be like the movie Schindler’s List where the movie is in black and white with only a few objects being in color. The feeling for this segment is whimsical and fun. It seems to show the world from the point of view of a child. The music in Labyrinth varies but the selection accents what is going on. A slow piano melody in the beginning sets the tone for this segment. Next we get a burst of classic orchestral music to later on slow European feeling circus music. To cap it off the music shifts suddenly into a miss mash of an electric piano and several other sounds you might find on one. The second segment is Running Man, directed by Yoshiaki Kawajiri (Goku: Midnight Eye; Ninja Scroll ; Wicked City). Unlike Labyrinth, this segment gives more narrative as to what is happening. In Running Man we follow Zach Hugh, a racer in a futuristic high speed sport (think F-Zero). Most people do not even survive a year but he has beaten those odds to become the greatest. This segment is darker than the previous one story wise. The art is very detailed with the parts of the vehicles, specifically the inside, being drawn crisply as well as characters faces. Running Man uses dark and tone down colors. Some scenes blend into one another while others are a cluster of colors. The story is narrated by a detective who is telling the story as if he is recalling it from memory. It gives a noir feel with the detective being in a trench coat and sometimes a fedora. What you can take away from this segment is how society thrives on dangerous sports and the reason they come to watch. However in the end they finally got what they came to see all along. 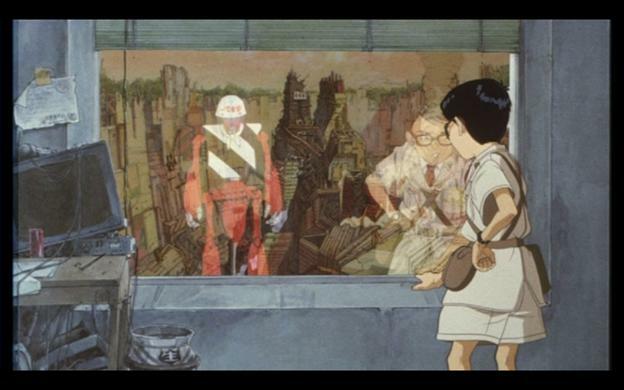 The third and final segment is Construction Cancelation Order directed by Katsuhiro OTOMO (Akira, Steamboy). This one has the most depth out of the three and is easy to follow. In the fictitious South American country of the Aloana Republic, Tsutomo Sugioka, a lowly employee has been given the task to shut down a facility used to extract resources from the harsh environment. The reason to stop production is because revolution has broken out and the newly formed government has refused to keep the contract of the company who owns the factory. Since the factory is located in an inhospitable area to humans the company has resorted to robots to do 99% of the jobs there. Costing them money and resources Sugioka has to recover anything salvageable, find out what happened to the one human manager, and shut down the facility completely. It is harder then it seems due to the head robot being programmed with the one task of meeting deadlines and running production into the ground. With Construction Cancelation Order the scenery is luscious and vast, with everything from plants and trees and even robots and also drawn and animated superb. The whole segment uses lighter colors then the previous two and only some scenes blend colors together. The accompanying music sets the stage at the beginning; it has a mysterious, foreboding, and exploratory feel to it. This segment as well as RunningMan seems to have a moral tagged in it. Construction Cancelation Order juxtaposes the factory and machines with a lush cornucopia of flora and fauna. The facility sticks out like a grotesque thumb in the beauty that is the rain forest. You see how it has become a more and more of a monster that only intends to destroy the environment around it. Neo-Tokyo ends where it begins with the little girl, her cat, and a clown inside a tent. You see the three of them go outside to a parade with misshapen creatures. It ends with a celebration which I think is fitting. For people who know little about or seen little anime Neo-Tokyo is a good place to start. It is not your average Shonen title and will dispel any pre conceptions some might have towards anime. You could show this for multiple purposes other than for pure entertainment. If someone is studying art this is a good example of different styles as well as light shading and effect. That also goes for animation fans. All three stories are short and simple, making it easy to show people who have not seen any anime. Fluid and beautiful to watch makes it hard for people to find fault with animation wise. My only problem with it is that I would have liked to see a little more of each world. Back story would have been nice in the Running Man segment; but this is only a little problem in an otherwise great anthology.